Michael Arnold has been a fan of Star Wars ever since he saw Lord Vader step into the blockade runner with that long black cape. The next two hours changed his life forever.As part of his love for Star Wars, he I always wanted a life size Darth Vader to put into a room in his house. One day he realized that he had a chance to actually dress as him. Since joining in May of 2008, Michael has enjoyed many events, but the A.J. 's events have been his favorite. Seeing all the kids, parents and troopers riding the go-carts and playing games has made this annual event incredibly enjoyable to him. Being a part of the 501st has changed his life knowing that he is helping to raise money for charities and knowing it is going to people that need help. He also loves to see the kids faces when they see all of their favorite characters. "Zod", as some of us have come to know him, was given his nickname by a couple of friends growing up. "That was a childhood nickname that David "Pesci" Raimondo (TB8789) and a good friend (that passed away a couple of years ago) used to call me after seeing Superman 2 with General Zod and the funny line- 'Kneel before Zod!' So as a tribute to my friend, Pesci said we should use that and the rest is history." Outside of the 501st, Michael is an I.T. Manager for a property management company in East Lansing, MI who also has a degree in Graphic Arts. 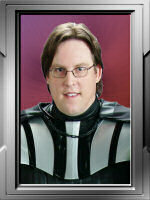 He enjoys working on his family and friend's PC's as well as collecting Star Wars stuff. He has 2 sons and a granddaughter. "Family is so important and cannot spend enough time with them, so I am hoping to get my son Nathan who has been doing NCS into armor soon and having him join the 501st when he turns 18."